Cruises are one of the most relaxing types of vacations you can take. And using the right credit card can help you earn discounts and sometimes even free cruise tickets. Each of the cruise credit cards on our best list offers the most rewards when you use your credit card to book cruises with that cruise line. Don’t worry; you can still earn a base amount of rewards when you use your credit card for other purchases. The reward structure for many of the cruise credit cards is the same. That makes it easy to narrow down your choice based on your preferred cruise line. Keep reading to find the best cruise credit card ​for you. Carnival Cruise Lines has more ships than any other cruise line, giving you a ton of ship options and itineraries to choose from. With the Carnival World MasterCard, you’ll earn 10,000 Funpoints after your first purchase or balance transfer. Most credit cards don’t include balance transfers for earning sign-up bonuses. Keep in mind when you transfer a balance, it takes up the available credit you’d otherwise use for making purchases and earning points. The points are worth up to $100 toward your next cruise purchase. 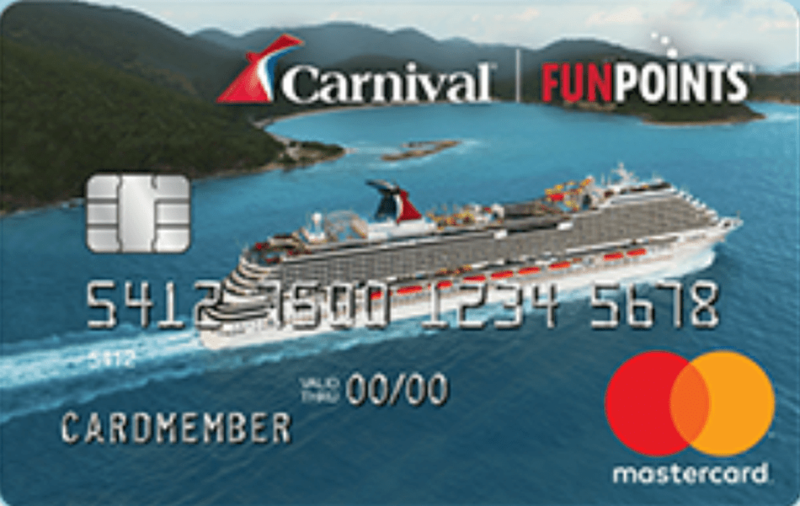 Ongoing, you’ll earn two Funpoints for every dollar you spend on Carnival Cruise Lines purchases and one point per dollar on everything else. Rewards can be redeemed for a statement credit for cruise or cruise discounts made within the past 180 days. Important Pricing: Enjoy a zero percent introductory APR for the first 15 billing cycles. The balance transfer must post to your account within 45 days of account opening. The APR is 15.99, 20.99, or 25.99 percent, based on your creditworthiness. There’s no annual fee and no foreign transaction fee. With the Princess Cruises Rewards Visa Card, you’ll earn 10,000 bonus points after you use your credit card for the first time. The bonus is worth up to $100 toward your next cruise purchase. There’s no minimum spending amount required to earn the bonus. You’ll earn two points for every dollar you spend on Princess purchases and one point per dollar on everything else. Get free access to your FICO score. Important Pricing: Enjoy zero percent APR for 15 billing cycles on balance transfers that post to your account within the first 45 days of opening your account. After that, the APR for purchases and balance transfers is 15.99, 20.99, or 25.99 percent, depending on your creditworthiness. There’s no annual fee and no foreign transaction fee. If you’re looking for a cruise line that’s great for the whole family, consider Disney Cruise Lines. With the Disney Premier Visa Card, you’ll earn a $250 statement credit after you spend just $500 on purchases in the first three months from opening your account. Ongoing, you’ll earn two percent in Disney Rewards Dollars on gas stations, grocery stores, restaurants and most Disney locations; earn one percent on all other purchases. There are no limits on the rewards you can earn and no blackout dates on redemptions. Select your own card design from a selection of favorite Disney characters. Among other Disney adventures, you can redeem your Reward Dollars at most Disney locations for onboard activities, theme park tickets, souvenirs, and more. Plus, qualify for six months of zero percent APR for the first six months on certain Disney vacation packages. Important Pricing: The APR is 17.99 percent. The annual fee is $49. While Holland America Line’s cruise ships offer programs for teens and kids, adults will find the ship’s enrichment programs enjoyable. Choose from options like cooking demonstrations, Pilates, and digital photography classes. Earn two points for every dollar you spend on Holland America purchases including those you make onboard the ship. All other purchases earn one point for every dollar you spend. You’ll earn a bonus 5,000 points after you make your first purchase. Redeem your points for discounts toward Holland America Cruises whenever you use your Holland America Visa to book the cruise. With the Celebrity Cruises Visa Signature Card, you’ll earn 10,000 bonus points after you make a qualifying transaction within the first 90 days of opening your account. You can redeem the bonus for a $100 onboard credit. You can also earn 5,000 additional points after you spend $1,000 within the first three months. Those points can be redeemed for a $50 credit on the ship. Earn two MyCruise Points for every dollar you spend on purchases and one MyCruise Point for every dollar you spend on all other purchases. Once you’re a cardmember, you’ll get 10,000 bonus anniversary points when you spend at least $10,000 on purchases each year. Plus get 50 percent off for a second guest at any specialty restaurant, 10 percent discount on Premium Beverage Packages, 10 percent discount on a Private Journeys shore excursion and an additional $300 discount on a future cruise of at least seven nights or more in a Concierge Class stateroom after making at least $5,000 in transactions within the first 60 days. Important Pricing: The APR is from 16.99 to 24.99 percent on purchases and balance transfers based on your creditworthiness. There’s a $69 annual fee and no foreign transaction fee. As a new Royal Caribbean Visa Signature cardholder, you’ll earn 10,000 bonus points after you make a qualifying transaction in the first 90 days of opening your account. The bonus points are worth $100 in onboard credit. You can also earn an additional 5,000 points if you spend $1,000 in purchases, a value of $50 in onboard credit. Ongoing, you’ll earn two points for every dollar you spend with Royal Caribbean and sister brands and one point for every dollar you spend everywhere else. Important Pricing: The APR for purchases and balance transfers is 16.99 to 24.99 percent. There’s no annual fee and no foreign transaction fee.